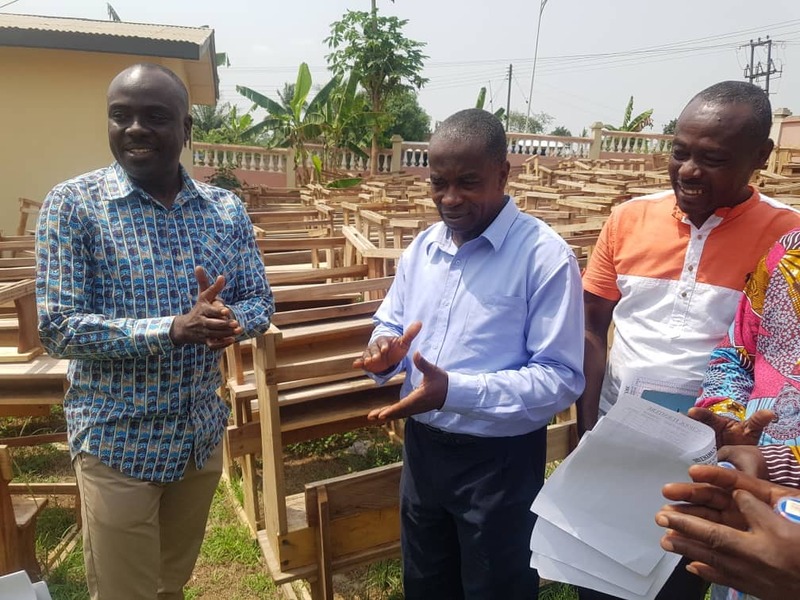 The District Chief Executive (DCE) for Ajumako-Enyan-Essiam, Mr Ransford Kwesi Nyarko, has donated 700 dual desks to a number of public schools in the municipality to help address the shortage of furniture in the schools. Speaking during the presentation ceremony on Tuesday February 12, 2019, the DCE said, an assessment done by the assembly revealed that, the furniture situation was poor in the selected schools and some pupils were sitting on the floor due to the lack of desks in the schools. The MCE charged both teachers and the pupils to embrace the culture of maintenance to ensure the furniture donated is put to lasting use. He gave the assurance that the assembly will channel more resources to have more desks manufactured because the 700 donated were still inadequate. The DCE said, a dual desk is meant for two pupils hence the the assembly will eradicate the situation of inadequate desks by 2020 by providing more desks to meet the number pupils in the various schools under his district. He advised the pupils to learn hard and be disciplined in order for them to come out of school, with flying colours. He has also assured residents of the resolve by the assembly to work assiduously to meet the plethora of demands including the fixing of roads, construction of chip compounds, schools among others.